Bing Ads have been an afterthought for most pay per click marketers for a long, long time. 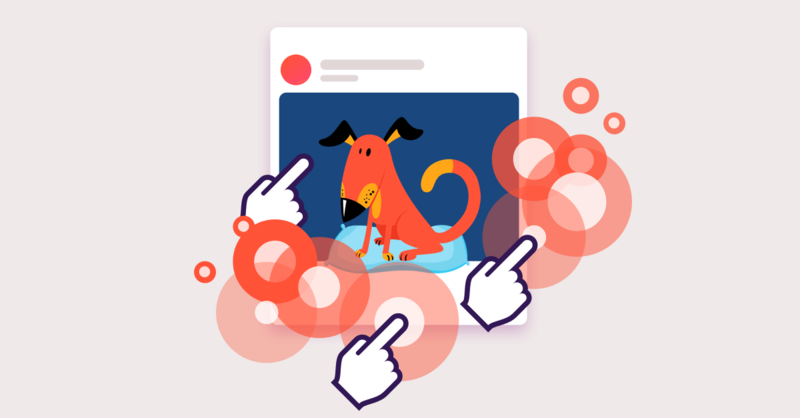 Traditionally, they were something pay per click advertisers only rolled out if after they had totally exhausted all their options on Google Ads… and most advertisers never got that far. But Bing Ads are actually a pretty sweet opportunity, especially if your audience tends to be older and more affluent. So it might be time to rethink advertising on this platform. Clicks on Bing are cheaper. According to WordStream, the average cost per click on Bing is 33.5% cheaper than on Google Ads. And a study from Spinutech also found that Bing Ads’ cost per click was substantially lower than that of Google Ads. Spinutech also got those results really quickly: They had only been optimizing their Bing accounts for two months, compared to twelve month’s worth of Google Ads optimization. Bing advertisers get access to 66 million users who can’t be reached through Google Ads. 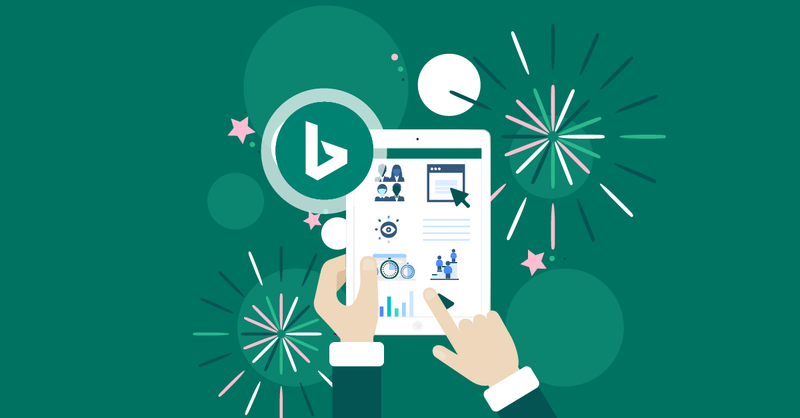 The Bing network also boasts “6 billion monthly searches in the U.S.” and “has 34.7% market share with 137 million unique searchers” in the United States. It’s no slouch globally, either. The Bing network serves 11 billion searches around the world every month and has a 9.6% global market share. It does particularly well in Europe (data in this graphic is from 2017). 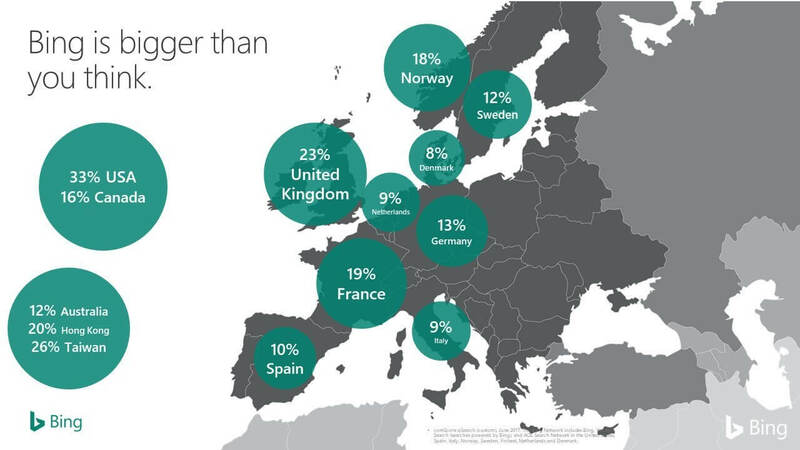 Bing attracts older and more affluent users. 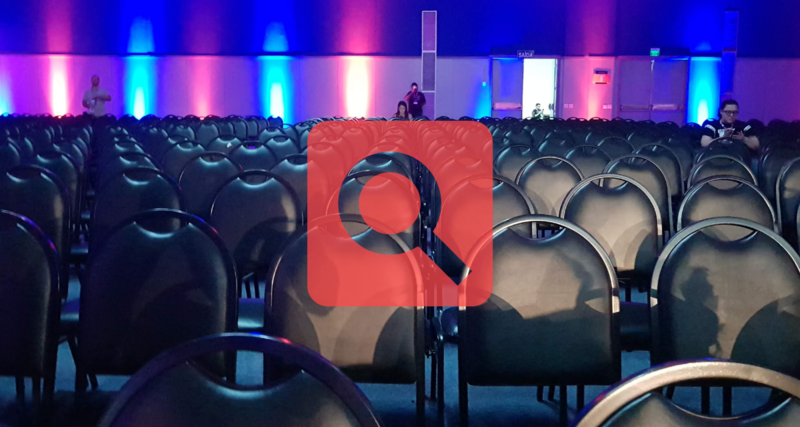 It’s nice to have a large audience to work with. But it’s nicer if that audience actually has money. And Bing users do have money. First of all, because they’re older. This means you’re not targeting teenagers. Your ads will appear in front of Baby Boomers and older Gen Xers – people whose careers have matured and who tend to own houses and have cash to spare. 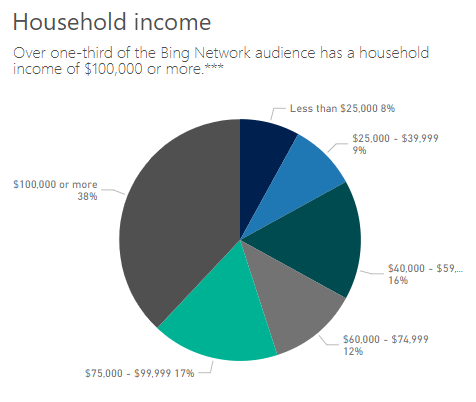 Over one-third of the Bing audience has a household income of $100,000 or more. Given that only 20% of American households ever earn $100K or more, Bing clearly has an outsized share of affluent users, both in the U.S. and other markets. Bing Ads has more flexible settings for ad groups within campaigns. If you’ve used Google Ads even a little, you know that if you want to use one network setting for an ad group within a campaign (say the display network), but another setting for a different ad group within that campaign (the search network, for example)… you’ll have to create an entirely new campaign. Because Google Ads doesn’t let you do that. But Bing Ads does. 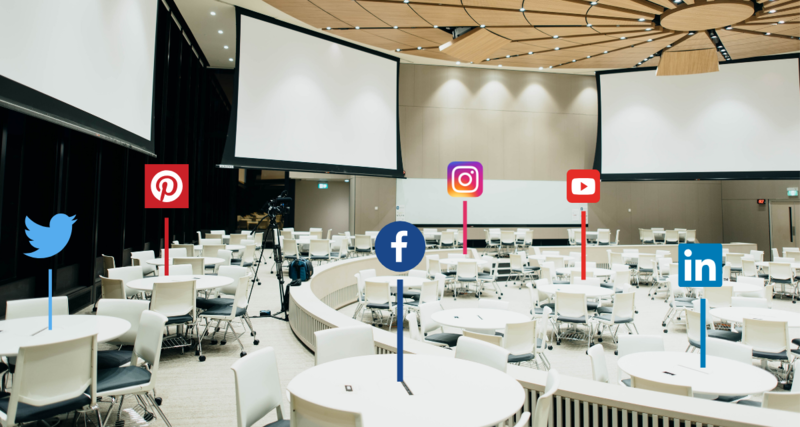 You can have different settings for networks, locations, languages and ad scheduling for different ad groups within a campaign. This could be mighty handy if, for example, you wanted to run the same ad group, but in three or four different languages. Or in three different countries. Being able to target those countries with very specific ad groups all within one campaign could make your ppc management much easier. And with Bing, you can do it. With Google Ads, each one of those countries needs its own campaign. Bing gives you more control over their search partners. It’s an open secret in digital advertising: The partner networks are where the bulk of fraudulent clicks come from. Not entirely, but mostly. But many new advertisers get lured into using the partner networks because they can offer so much volume. Trouble is, unless you go in and handpick sites – one by one – your only option with the search partners network in Google Ads is either “on” or “off”. Bing Ads give you another choice: You can be on “All search networks”, “Bing and Yahoo! Search owned and operated only”, or “Bing and Yahoo syndicated search partners only”. Even without the search partners, when you advertise on Bing, your ads will appear on Bing, Yahoo, and AOL. None of those is as big as Google, of course, but it does help expand the reach of your ads. And because you can have ad groups with different network settings within one campaign, you can do much more accurate testing of these different networks. Bing Ads still has exact match. Bing Ads gives you robust demographic targeting. 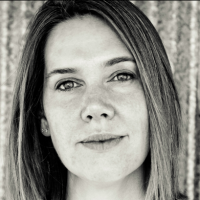 Want to bid 20% more for men than women within a certain ad group (or a whole campaign)? Bing Ads lets you do it. Google Ads doesn’t have this functionality… unless you create a separate campaign. You can import your Google Ads account directly into Bing with just a few clicks. If you tried Bing a few years ago, you may remember having to rewrite and reformat ALL your ads to get them to run on this platform. 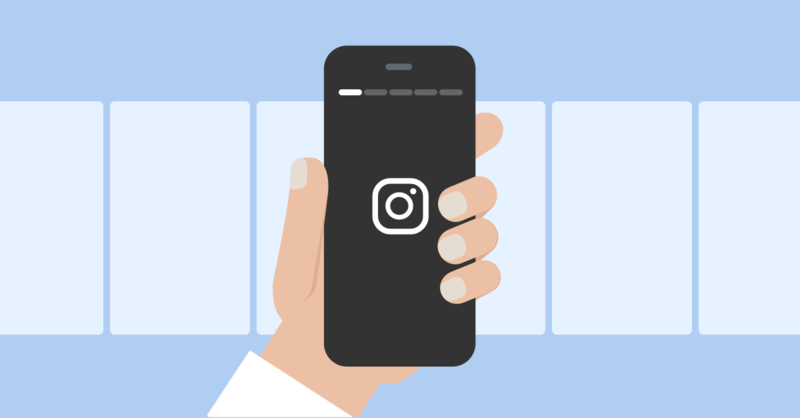 It was a huge pain, and many advertisers with really large, complex accounts, just imported their top 20% most active ad groups and left it at that. No more. 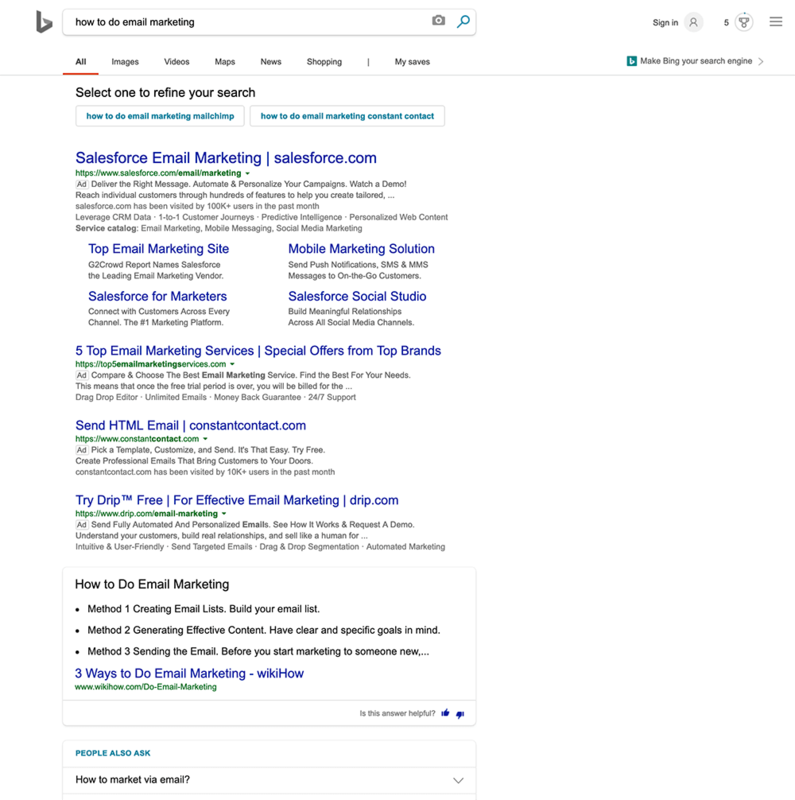 The Bing Ads interface and the ads themselves are all but identical to Google Ads now, so you can import your entire campaign (even the big, complex ones) and have your ads up and running in no time. Bing Ads and Bing’s search results look remarkably similar to Google Ads and Google’s search results. This makes importing your Google Ads into a new Bing account easier. If you’re struggling to make Google Ads work for your business, and your audience skews “older” (over 34) and more affluent, you should definitely test Bing Ads. Especially because one of the biggest drawbacks with Bing Ads has recently been overcome: Their reporting. 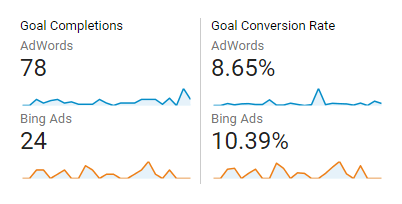 Because Bing Ads (unlike Google Ads) can’t be easily integrated with Google Analytics, some advertisers held back from using it simply because the reporting was difficult to use. We’ve fixed that problem. Whatagraph users can now view their Bing Ads data in the same graphical interface that they use for Google Analytics data, Google Ads data, or any of our other integrations. And just like with our other integrations, you can automate your Bing Ads reports, use them with white label reporting if you’re an agency, or send them to whomever you’ve got an email address for. Reporting doesn’t have to be hard or time-consuming. Not for Bing Ads, or for anything else. Interested? Start a free trial of Whatagraph today.